FlameShieldä acrylic coated fiberglass sleeve is designed as a primary insulation sleeve for protecting small diameter wire, cable, lines, hose, and pipe from high temperature, flame and environmental contamination. Recognized by UL / CSA for 220°C, 7000V service, and complies with VW-1 flammability requirements. Conforms to, and is listed on the QPL for MIL-I-3190/9. Available in 3 grades: NEMA Grade A-1, B-1 and C-1. Extremely flexible and easily installed. 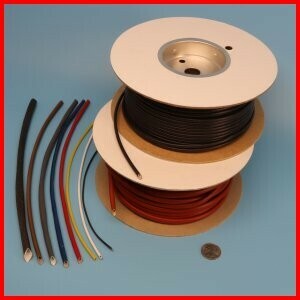 Used in electrical apparatus as a primary or secondary wiring insulation. Suitable for use in silicone free requirement environments. Resistance to solvents, both aromatic and aliphatic; fuels, including JP-5; and oils, including Skydrol. The inner braid is very fine and dense, and along with the precision Acrylic coating, this is the toughest cut and abrasion resistant flexible sleeve we have available for wire, cable and hose protection. Also provides protection from ozone, UV and abrasion. This product is UL/CSA approved and used on a wide variety of equipment such as fixtures, appliances and motors for wiring protection. This sleeve is available in a variety of colors. This sleeve is only available in full spool lengths shown in the catalog.